SEO Sherpa ranked 3 SEO company in Dubai, UAE. We analyze data to determine the exact search volume and competition for the key phrases being searched by your prospects. We help Google to rank you for and position you for best results. We promote your website using proven mix of media content. The ranking report shows before and after results and give you a unique login to the Google analytic’s campaign dashboard where you can verify traffic and website statistics. Thanks for the 5 star rating Moiz - you rock! Thank you for leaving us a 5* star rating. We truly appreciate it. I would certainly recommend SEOSherpa and in particular James Reynolds. Professional and Friendly, these guys will certainly get your webpage noticed! Three words: Work With Them! Rarely in our region do you find such a slick, well managed operation such as SEO Sherpa. Not only are we number one Google afer three months (as promised), but they go that extra mile week after week to make sure we are always at the cuttign edge of our Search and up to speed on the latest information. I attended James Reynolds presentation about SEO. I found it informative and engaging. James has since done some work on our company's website. We are very impressed with the results of the detailed work. Highly recommended! I want to highly recommend SEOSherpa for their great work done so far in only a short space of time on my site. Starting up my new site and business meant I needed quick and accurate results in what is a competitive market. The strategic plan and offerings outlined by the team from day one were spot on. I went for their basic package that fitted my budget nicely and had all the necessary tools to ensure my site started its journey the right way. My aim was always to get more traffic to my site and hopefully in turn, progress this into new business leads. Throughout the process I have been constantly updated with what the team are working on behind the scenes, along with suggestions and pointers that could improve my SEO results, such as the introduction of my new freelance design blog. All in all, I have every confidence that the statistics and results received so far after only two months of targeted marketing will only improve given the time and hard work put in by the team. Keep it up guys! Before we started with SEO Sherpa, you could not find our site in Google search at all. We knew that our website is the portal to our customers so we had to act quickly. As SEO Sherpa came highly recommended by people we know ,we decided to sign up with them even if we did not really know what they were going to do. By the time they had finished working on our site, we have climbed the ranks and we now show in the results almost every time! Our calls and enquiries have increased dramatically and for this I thank James and the team for all the hard work. I would highly recommend James and SEO Sherpa for their in-depth SEO knowledge. Fantastic company to work with. They explain everything clearly so that you understand the process and where you are going. SEO Sherpa's working style is extremely seamless and very organised. The support is diligent and helpful. The whole process has been a breeze. Best investment our company has made in its future growth. Thank you very, very much - we are pleased to be working with you. One of those rare SEO companies that actually knows what it is talking about and delivers the results to back it up. Definitely recommended. I must commend SEO Sherpa on the way they work. Brilliant and so organized. Makes us clients feel so secure even before we decide whom to go with. They give us information about a subject that we know little about and in which they are experts so that we can make informed decisions. I was referred by someone who highly recommended them. Looks like they were right and I haven't even started. An exceptional presentation on SEO trends presented by James Reynolds at the British Business Group networking event. Informative, engaging, with easy-to-action tips, James' knowledge had the entire audience scribbling notes. I've recommended SEO Sherpa on several occasions. They are knowledgeable, highly responsive and above all else get great results. Great team to work with. SEO Sherpa are a team brimming with expertise and dedication. If you want higher rankings, more traffic and sales I strongly recommend you work with them. They will help your business grow. I had the absolute pleasure to meet Mr. James and the SEO sherpa team while looking for a company to assist us with SEO. We got to interview a couple of companies but one thing's for sure SEO Sherpa know exactly what they are doing and what they are talking about. Nothing is as disappointing as having a company that is not transparent in their operations or one looking for shortcuts especially when it comes to Search Engine Optimization procedures. But not with this team. . . SEO sherpa are very very profession, transparent in their findings and recommendations, very friendly, easy to work with, result and action oriented and always on time to meetings and with all the necessary information and proposals that we requested. Very supportive , well informed as they have all the information right at their finger tips. I mean, getting to work with this team was simply amazing and was just a walk-in-the-park. What every company needs is a company they can depend, and more so one that follows all proper procedures.. 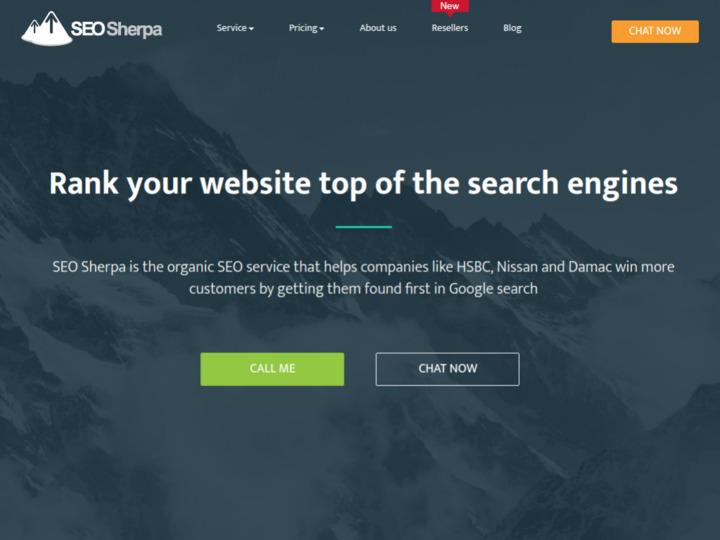 I would definitely recommend SEO Sherpa ! I give you ten stars of excellence. You will not be disappointed signing up with them. Keep up the fantastic job SEO Sherpa! SEO Sherpa surpassed expectations by increasing our desired reach and helping to build brand awareness. They have taken delicate care to ensure we are well informed and supported throughout the duration of our relationship together. I have worked with Jodi and I highly recommend having her by your side. Hiring SEO Sherpa is the smartest move you can make for your business... Hands down! Well organized, timely and efficient. An excellent team that truly practice what they preach on their commitment to quality customer service. Really enjoyed working with them for the SEO & PPC set up for my company. Excellent team and service. After 6 months we started seeing fruitful results on Google Search! Highly recommended. On behalf of Mineral Circles Bearings: Working with Sherpa has been a complete pleasure. The support team, specifically Ben and Jodi, are lightning-quick when it comes to sending replies. Also, they are always on time when it comes to submitting monthly performance reports. Another excellent experience was when Jodi sent me a detailed and itemized account of all the services and collateral mentioned in the agreement between our company and Sherpa. She included the dates of the emails where the particular item was explained and reported. For us, this is really going the extra mile. We hope to work with them longer! Thank you Team Sherpa! James and his team are great and very professional. The quality of work they deliver is fantastic and fast. We have been working with James & SEO Sherpa team for quiet some time now, they all are extremely passionate about their work and prompt with the responses.We are happy with the services they deliver and would recommend them strongly. SEO Sherpa headed by James is no. 1 SEO agency company in Dubai in providing its customers the promise to deliver result. I worked with him in my previous company's SEO project, he is easy to deal with and will negotiate with you 'til bottom price. :) He is the first person whom I considered my teacher as he let me understand the world of SEO and a bit in depth of it. He might not realized it, but he showed a great customer service experience by sending every transaction online from reminders to follow up. He even sent me an SEO starter pack thru courier which I thought a great move in getting your customer attention. Not only that, they have a dedicated SEO team that will focus on your company alone and not compromising the result. Cheers to SEO Sherpa Team! more success to your business! I have been working with James and his team for 4 years and find the experience extremely positive for every project we work with him. I have had the pleasure to work directly with him for client projects and have also heard him present in person and on webinars. Each time he is very professional, knowledgeable and experienced. He has helped educate me and has been a mentor in his field of experience. A true champion in the field of SEO and a go to guy for any brand to achieve better rankings.